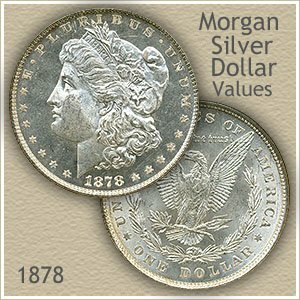 Your 1878 Morgan silver dollar value is a minimum of $20.81 each. Many are worth a significant premium due to collector demand often raising the value far above silver bullion price. Of interest to collectors, 1878 is the first year of the popular Morgan dollar series. Additionally those struck by the Philadelphia mint have different unique varieties on the reverse, each distinctive and collected separately. Images are further down the page identifying each variety. Further affecting value: Three different mints in 1878 coined silver dollars, all valued separately today. Philadelphia, San Francisco and thirdly, valued the highest are those from the Carson City mint. Your job is check for these mintmarks, locate them with the help of the image below and determine if your silver dollar has a "CC" or "S" mintmark, or no mintmark on the reverse. As reflected on the chart, 1878 Morgan silver dollar value is accurately determined by, variety, mintmark and condition. Review all of these factors discovering how much your coin is worth. Scarcity and demand combine to raise the minimum value of 1878 silver dollars minted at the Carson City mint. These are identified by the "CC" mintmark found on the reverse below the eagle's tail feathers. Also worth mention, San Francisco minted coins identified by an "S" mintmark and Philadelphia coins (no mintmark) both have premium values compared to other dates in the Morgan series. Easily identifiable changes were made in the first year to the reverse design of the Morgan dollar. Well worth checking, the specific reverse variety of your coin has an impact on value in the uncirculated grade. Value all has to do with the number of tail feathers of the eagle on the reverse design. A careful count of the feathers determines if there are 7 or 8. Each variety is valued separately. The hardest of the three reverses to spot are the small details determining the 7 over 8 feather variety. Look for tips of feathers extending from underneath the major feathers. The mint in Philadelphia settled on the 7 tail feather design and it continued as the design for the remaining years of the Morgan dollar series. 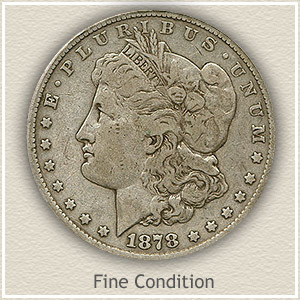 Essential to highest accurate coin values is determining the condition of your 1878 silver dollar. By closely examining the surface and judging the amount of wear reflect its "grade." Entries in the value chart above are listed under these grade headings. Often an old coin is common in heavily worn condition but scarce and valued much higher if significant detail remains. 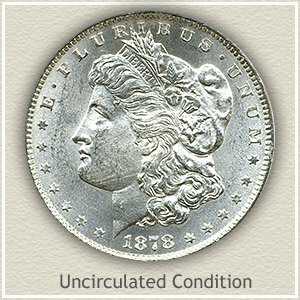 Uncirculated: Is your 1878 Morgan silver dollar value at a premium because of "uncirculated" condition? An uncirculated coin is without any wear to its surfaces. Original silver mint luster still covers all design details. Holding your coin by the edges, and by tilting and slowing rotating, unbroken bands of luster radiate from edge to edge. Any wear disrupts these bands, most evident on Liberty's cheek. Extremely Fine: After only short time in circulation the highest parts of the design begin to wear down slightly. 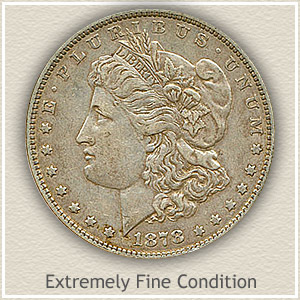 Extremely fine condition describes a Morgan dollar with light wear. Hair detail is still well defined, with just minimal flattening overall. A smoothing of the chin and cheek is evident. 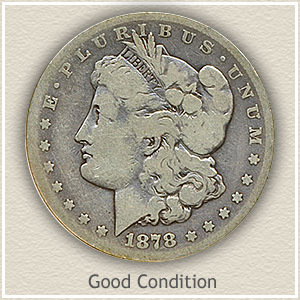 Overall, in this condition your silver dollar portrays a sharp crisp appearance, with a nice silver gray coloring. Fine: Wear has reduced original design detail to the point of merging. All fine lines in the hair above the forehead have disappeared, replaced by large flat areas. Once rounded, the front of the neck and cheek below the eye are now noticeably flattened by wear and abrasions. Despite moderate even wear, lettering and rim are well defined giving your coin a respectable appearance. Good: Lack of design defines this old silver dollar as "Good" condition. Liberty is mostly an outline, once a cap, hair curls and head band are now obscured. Lettering now connects to the rim in places but readable. Lack of any hair line above the forehead places this coin solidly in this lower grade. Showing excessive wear, your 1878 Morgan silver dollar value is tied closer to its silver content than collector value. Silver dollars are Popular, very Popular… finding a Morgan silver dollar in your box of old coins is finding a coin worth at least $18.09 . Now determine its date, mintmark and condition, refer to the chart and its value is often surprising. No surprise here, the large size and classic designs insure Silver Dollars are one of the favorites with collectors. Each series is covered in detail, with values listed for all dates and mintmarks, including more on your 1878 Morgan silver dollar value. 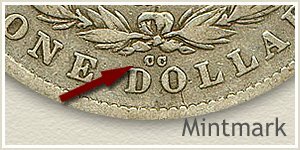 Compare your coins to images in the sections "How to grade Silver Dollars" and accurately discover how much your old dollars are worth. All old US coin values. 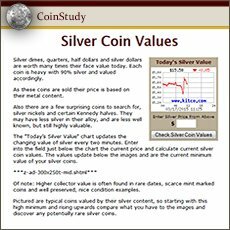 Value charts in combination with grading images to judge condition discovers how much your old coin are worth. 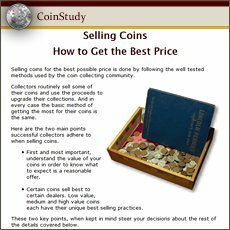 Get the best price if selling by knowing the accurate value of all your coins.